Radiation Oncology Associates and the Inova Health System are proud to announce our new APEx accreditation from the American Society for Radiation Oncology (ASTRO) Accreditation Program for Excellence, following ASTRO’s rigorous review process spanning several months. 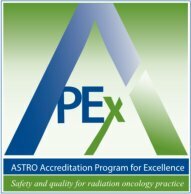 APEx is an independent radiation oncology practice accreditation program that builds upon and integrates ASTRO’s quality improvement initiatives. APEx was created to ensure accountability in radiation therapy practices. The program establishes standards of performance derived from evidence-based guidelines and consensus practice for radiation oncology. Its mission is to recognize facilities by objectively assessing the radiation oncology care team, policies and procedures, and the facility. Radiation Oncology Associates and our Radiation Oncology Departments uphold the rigorous standards of APEx accreditation. Radiation Oncology Associates is the first practice in the U.S. and internationally to earn ASTRO’s APEx accreditation, underscoring our rigorous commitment to excellence in patient care, robust safety standards and interdepartmental peer review programs. Within the greater Northern Virginia region, Radiation Oncology Associates partnered with the Inova Health System is the exclusive provider of APEx accredited radiation oncology services and personalized patient care.